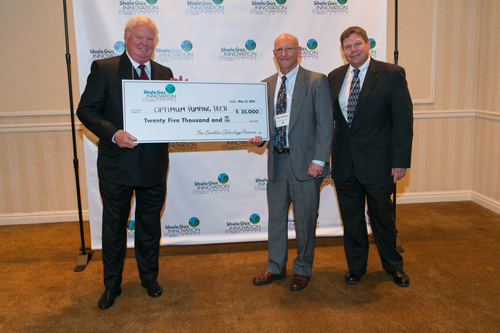 KCF Technologies accepts Winner’s Check. 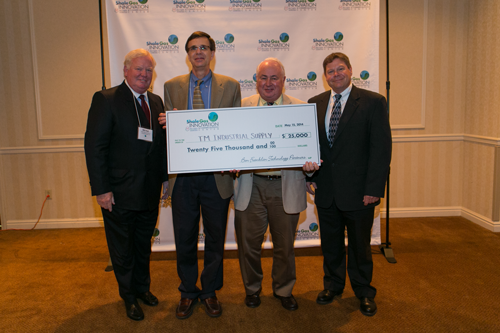 Pictured from left are Bill Hall, SGICC Director, Jeremy Frank, KCF President and Co-Founder, Gary Koopman, KCF Co-Founder & Sr. Technologist, and John Siggins, SGICC Assistant Director. Optimum Pumping President Glen Chatfield accepts winner’s check. 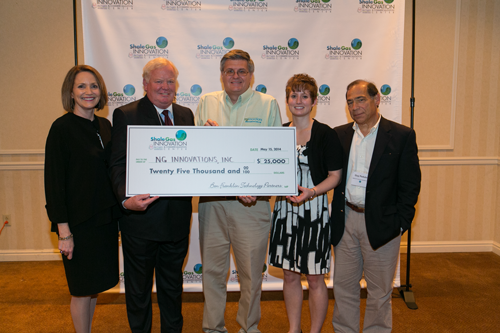 TM Industrial Supply’s Ed Barthelmes and CEO, Carl Steiner accept winner’s check. The sponsors for this year’s contest were: Ben Franklin Technology Partners (http://www.benfranklin.org), ANGA (www.anga.us), Aquatech (www.Aquatech.com), Baker Hughes (www.bakerhughes.com), Cabot Oil & Gas Corporation (www.cabotog.com), CONSOL Energy (www.consolenergy.com), Chesapeake Energy (www.chk.com), Chevron (http://www.chevron.com/ctv/), EQT (www.eqt.com), First National Bank (www.fnb-online.com ), GE Oil & Gas (http://www.ge-energy.com), Little Pine Resources (http://littlepineresources.com), the Marcellus Shale Coalition (http://marcelluscoalition.org), PPG Industries (www.ppg.com) , Praxair (www.praxair.com), Range Resources (www.rangeresources.com), Seneca Resources (www.natfuel.com/seneca), and Williams (www.williamsinthenortheast.com).